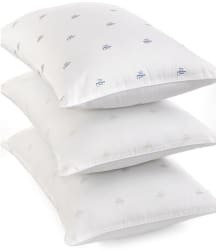 As one of its daily deals, Macy's offers the Lauren Ralph Lauren Logo Down Alternative Standard/Queen Pillow for $5.79. Opt for in-store pickup to avoid the $9.95 shipping charge, or get free shipping with orders of $25 or more. That's pennies under our November mention and the lowest price we've seen. (It's the best deal now by $14.) It's available in medium, firm, or extra firm densities and measures 20" x 28". It's also available in King for $8.79. That's pennies under our November mention, $23 off, and the lowest price we've seen. It measures 20" x 36". Both deals end today.